If you look at the moon in the next night or two withbinoculars or a small telescope, you will be able to see a number ofinteresting features. 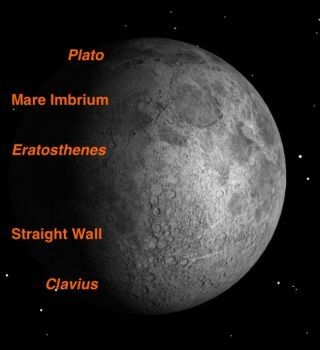 The Mare Imbrium is bordered by the Lunar Alps on thenorth. Nestled in the alps is the beautiful crater Plato, 63 miles in diameter(101 km. ), with a smooth flat floor resulting from a lava flow. There are anumber of tiny craterlets on the floor of Plato which are often used as testtargets for large telescopes. Although Plato appears oval from Earth, this isan effect of perspective and the crater is, in fact, round. On the southern rim of the Mare Imbrium is lunar Apenninemountain chain, with the complex crater Eratosthenes on the terminator, theboundary between light and shadow. Eratosthenes is a terraced crater 36 milesin diameter (58 km.) with a large central peak. It is a miniature version ofthe mighty crater Copernicus, still in shadow to the west. Sweeping further south along the terminator you will soonsee one of the most spectacular features on the lunar surface: the Rupes Recta,known in English as the Straight Wall. This is a fault line 68 miles long (110km.) When lit by the rising sun, it looks like a high steep cliff, but in factits slope is quite gentle and its height less than 985 feet (300 meters). Between the Straight Wall and the moon?s south pole youwill find one of the largest craters on the moon, Clavius, 140 miles indiameter (225 km.) This huge mountainous ring contains a series of ever smallercraters...how many can you count? These are just the highlights of one of the richest areason the moon. A good map like the one by Antonin Rukl availablefrom Sky Publishing will guide you to hundreds more objects.